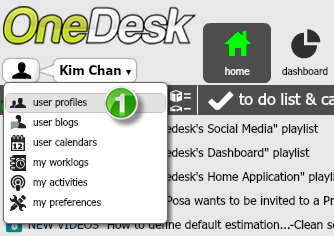 OneDesk makes inter-office communication easier. You can send a message to and chat with any OneDesk user, whether they are part of your organization or not. .
Who is automatically added to your contacts list? When you send a message though OneDesk, you must choose a recipient drop-down list. All members of your organization, and members who are part of the same projects as you are automatically added to your contacts list. If you wish to send a message to OneDesk user who you do not share any projects with, or who are not part of your organization, you need to add them as a contact. Go to your personal menu and select user profiles (1). Searchfor the contact you wish to add (2). Click the Add to Contacts button (3). The contact with now appear in your contact list. You can now add them as a recipient in a message, or chat with them.